NEMO - HOOF SHINE provides a brilliant shine, but also nourishes the hoof. 100% natural formula. - 250 ml. 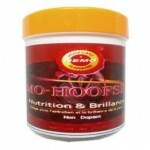 Hoof nutrition and hoof shine. HOOF SHINE is a disinfectant, strongly recommended for bleimes or seimes. Composition : Royal walnut or Juglans regia, helianthus annuus, methionine, calendula, daucus carota. Clean the hoof and apply NEMO HOOF SHINE.